15-round Sig Sauer P229 9mm Magazine. High-quality replacement! This durable Magazine fits updated Sig Sauer P229 pistols chambered in 9mm. It features a 15-round capacity and steel finish. Get yours here for LESS! 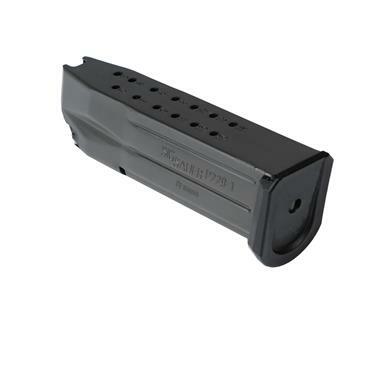 Sig Sauer P229 9mm Magazine, 15 round is rated 5.0 out of 5 by 2. Rated 5 out of 5 by Chris The Train Guy from Great buy/Factory SigSauer mag! This is the exact factory SIG magazine for the newer,enhanced/E2 model P229 pistols that hold 15 rounds of 9mm. The Guide was the first place I found them “ in stock”,and at a good price! Smooth feed for your P30.